The future of Plum Island and the extensive wildlife that it currently harbors is uncertain. Over 600 acres of this federally owned 840-acre island are undeveloped, in large part because access has been restricted over the decades, first to protect Fort Terry, then to protect the Animal Disease Center. But now, the federal government’s real estate agent – the General Services Administration (GSA) – is recommending a public auction of this de facto wildlife preserve. Formally recognized as a Long Island Sound Stewardship site, an Important Bird Area, and a critical habitat area, Plum Island is home to many rare and ecologically important plants and animals including at least 187 species of birds—of which 57 are New York State Species of Greatest Conservation Need. It’s a major stopover for migrating birds on the Atlantic Flyway, the largest seal haul-out area in southern New England, and it flanks Plum Gut, an area rich with marine life. GSA has the discretion to protect these natural and cultural resources by conserving the open space and selling the developed portions of the island, but instead it has chosen to ignore those interests and focus solely on putting Plum Island on the auction block. If it is sold to a private buyer as GSA recommends, one of Long Island Sound’s great places could be lost forever. While GSA turns a blind eye to the preservation of Plum Island, the Town of Southold, NY, and members of Congress from around the Long Island Sound region have vowed to do what they can to protect it. Southold, which Plum Island would become part of upon leaving federal ownership, has proposed zoning that would protect key habitats by restricting development in a new 600-acre “Conservation Zone.” However, as zoning can be changed, this does not provide permanent protection for the wildlife on the island. Save the Sound and other Preserve Plum Island Coalition members are advocating for a more permanent conservation solution. Members of Connecticut’s and New York’s Congressional delegations are also taking action. Representatives Tim Bishop (D-NY), Joe Courtney (D-CT), Peter King (R-NY), Rosa DeLauro (D-CT) and Michael Grimm (R-NY) have introduced a bipartisan bill into the House of Representatives entitled “Save, Don’t Sell Plum Island.” Senators Richard Blumenthal (D-CT), Charles Schumer (D-NY), Chris Murphy (D-CT) and Kirsten Gillibrand (D-NY) introduced a companion bill in the Senate. The bills are designed to counteract 2008 legislation that aimed to offset the cost of building a new $1.2 billion National Bio-and-Agro Defense Facility (NBAF) in Kansas by auctioning Plum Island. Between Southold’s forward-thinking zoning restrictions, which will diminish the development value of the island, and the cleanup costs associated with past island activities, it’s virtually guaranteed that there would be no funding left for NBAF. By decoupling Plum Island and NBAF, our elected officials are working to remove the false incentive to sell our regional treasure for a quick buck. The United States spends hundreds of millions of dollars each year to purchase properties for conservation. It defies logic that the same government is planning to sell off a property it already owns, particularly an official Long Island Sound Stewardship site that possesses such a rare mix of important ecological resources and historic sites and is located in one of the most overdeveloped regions of the country. Plum Island is one of the last places in Long Island Sound that offers a wild, safe space for many species of rare wildlife, and the federal government should be doing all it can to retain this area. The U.S. Fish and Wildlife Service and the U.S. EPA’s Long Island Sound Study have identified compelling government interests in protecting Plum Island’s habitats for rare wildlife and plants. 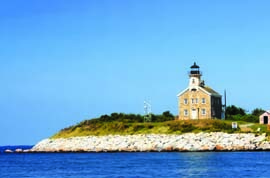 We think there is also a government interest protecting the historic sites of Fort Terry and the Plum Island Lighthouse, as well as open space that can be used for low-impact recreation. We are grateful that our legislators have picked up the mantle to protect this natural treasure and we hope in turn that our fellow citizens pick up the phone to thank them for their efforts. We urge Congress to pass the “Save, Don’t Sell Plum Island” bills through the Senate and House quickly. In the meantime, there is a “For Sale” sign waiting in the GSA office. Alternative Energy in the Sailing World!